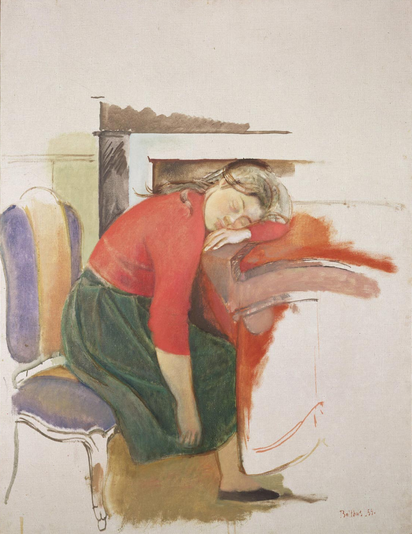 CLOSE VISUAL ANALYSIS: Balthus' "Young Girl Asleep (Frédérique)"
Balthus’ Young Girl Asleep (Frédérique) sits without much pomp or circumstance in the Philadelphia Museum of Art’s Modern and Contemporary Art Wing. Painted in oil on canvas and signed and dated 1955, the painting is easy to underestimate not only due to its location (it is located across from a Picasso) but also because the work looks strangely unfinished. This painting addresses the relationship between adolescence and dreams through its use of rhythm and pattern, its contrasting degrees of finish, its use of color, its compositional elements that include the viewer in the world of the painting. In this work, Balthus juxtaposes the world of adolescence and the world of dreams, showing the viewer how similar they are. The painting depicts a girl given over to deep sleep in a world dominated by planes of flat, simple color. Clad in a red-orange shirt and forest green skirt, she sits in a blue-and-yellow striped chair, leaning on a table, her left arm a makeshift pillow. The tablecloth is colored a similar red-orange with a dark peach accent. Her right arm hangs down vertically in the center of the painting; her back forms a gentle curve beginning with her skirt and culminating with her head. Behind her is the beginning of what appears to be a fireplace and a mantel, sketchily rendered—or rather, implied—in dark grey and palest blue. Her flesh is a light peachy-yellow, and her hair is painted in loose strokes of gray, brown and blue-green. The rest of the canvas is characterized by the sparseness of or absence of paint. The top fourth of the painting appears to be completely untouched by pigment; the canvas here appears to be unprimed. Overall, the color is applied thinly and is reminiscent of the effects of watercolor. It is as if Balthus approached this piece without creating an underdrawing, simply rendering what he wanted to depict by drawing with his oil paints. The bottom left and right corners are painted with simple colored lines that are reminiscent of the parts of the composition adjacent to them: the chair is finished with a blue curve, and the tablecloth with an orange curve. The girl has only one leg, and it is sketchily drawn at that. The success of this painting is largely due to its lack of finish. It is also due to the visual interest created by the juxtaposition of the circular and arc-shaped rhythms produced by the girl’s body and by the tablecloth and chair in conjunction with the decidedly straight-edged fireplace, mantel and table edge. The contrast among the various degrees of finish in the painting also suggests being in a stage between childhood and adulthood. The former is represented by the simpler colorings and renderings, while the more detailed elements demonstrate maturity. These elements combine to create a picture of a young girl caught in a dream, completely overtaken by deep slumber, as she dreams the space around her, symbolized by the contrast between the rendered setting and the empty, blank canvas at the edges of the painting. The empty whiteness symbolizes the haze of the dream and of adolescence; this young girl is not only caught in a dream, but she is caught in adolescence, in a place between childhood and adulthood. The way the girl seems to float on her chair weightlessly emphasizes the dreamlike, unreal quality of the painting. And all is not right in this world of the dream; the girl appears to lurch forward as she subconsciously senses our presence in the room, watching her. We are voyeurs of her dream and of her sense of self, and our mere presence in the room with this vulnerable girl, our gaze onto her body, creates a decidedly sinister air. In this painting, broad, flat planes of color contrast with more detailed areas of focus. The girl’s blouse and skirt, while simply colored, have several wrinkles, while her face is painted with undertones of red, blue and green, giving it a more lifelike feel. Her left hand, folded under her head, also displays a sophisticated use of highlights and shading. In contrast, at the end of her skirt, her right foot is painted in the crudest forms—it is a combined rectangle and triangle. The coloring of the tablecloth is rough and childlike. Thus the handling of color suggests a dichotomy between youthful expression and mature application, leaving the nature of adolescence somewhere in the middle of these two poles. The dreamlike feeling of this painting derives from Balthus’ use of curves and circular forms that gently guide our eye around the painting. One such form begins with the green skirt and curves around the girl’s back, around her head before being caught on her folded arm, dropping our eyes down to the strong vertical element of her right arm, which blends into the green skirt, thus repeating the visual circular motion. The viewing program creates a trance-like state. Another large circle is created through tracing along the green skirt, up through her back, along her head, then continuing along the arc of the tablecloth and ending with the thin orange line of paint at the bottom right of the painting. The curves of the tablecloth and of the chair back and seat also interact dynamically with the girl’s form. The result is a series of interlocking complex curves and circular forms that lead the eyes around and around the painting, creating a rhythm that emphasizes the girl’s gentle slumber, echoing the natural rhythm of breaths in slumber. While this painting has a largely placid composition, there are several jarring elements that suggest that disrupt the peace in this girl’s dreams and in her world. Her one visible leg is sharp and blocky and takes the place of where we would expect the table’s leg to be, fusing her body and the table in a chimerical way. Additionally, the juxtaposition of the girl’s head and the fireplace and mantel behind her creates a tight, uncomfortable feeling, as though her head is firmly wedged into that space. It is as if she is trapped in the dream or trapped in adolescence itself. Additionally, the red-orange of the shirt and tablecloth, placed in front of the unfinished fireplace, conjure up the suggestion of fire, a fire that spreads messily out of the confines of the fireplace and into the rest of the composition. Thus, with a deceptively simple composition and palette, Balthus has allowed us to view an intimate, vulnerable portrait of a girl lost in an “in-between” space—both in her present state of slumber and in her growth and development as a young woman. The contrasting simple and sophisticated application of paint, the rhythmic lulling forms, and the blocky, entrapping composition, all support the interpretation of this painting as an example of Balthus exploring the murky state of adolescence. Much like a dream, adolescence is an unclear moment in life and represents an unfinished, incomplete state of being. Like a dream, adolescence progresses ever forward in a lulling manner, but is often confining and even marred by nightmarish interjections and interruptions. INTERVIEW: "Tales of the South Pacific"